2 strong little 8-cell embryos. The embryologist did not provide a “grading.” I asked if they were good and strong and she replied that they were. That was enough for me. I don’t think people at infertility clinics make a habit of giving their patients false hope. And anyway, they were the two strongest. One of the other 4 stopped dividing, and the last was a 6-cell which they will continue to monitor. I’m leaning toward not freezing it, but will wait for the embryology report on Tuesday. So here I am, officially in my two week wait, which as we all know is probably the hardest part. There are no more ultrasounds for updates, no more daily trips to see the doctor. So of course I feel the need to take some control and “do” something. Enter: my juju. 1. Pineapple Core There is actually some science behind this one. 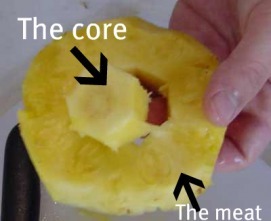 Many-a-blogger (including myself) have dedicated entries to the almighty pineapple core. I ate 1/5 of a pineapple yesterday (on transfer day), and will continue to eat one piece for the next 4 days. Also, pineapples are a sign of welcome, so, “Welcome home, Embies! Please settle in here for the next 9 months or so!” In this picture, the pineapple is upside down to help ripen it faster and more evenly. 2. Sandstone Vase From Sedona, AZ My parents have been to Sedona a number of times and on their last trip, my mom came home with this little token for me. I figured she just thought it was pretty (it is! ), but just the other day, she referred to “the fertility vase I bought you in Sedona.” And then upon seeing my confused face, added, “but I don’t think I ever told you it was for fertility.” Sedona is said to have healing powers, and Kokopelli (the cute little dude featured on this vase) is a symbol of fertility, so it all makes sense. Immediately, I cleaned it out (more like just blew the dust out and into my eyes), and placed it by my pillow on my nightstand. Inside, I placed a piece of rose quartz (also from my mom), which is a gem stone that is said to have some hidden fertility magic. I brought the quartz with me to the transfer yesterday and held on to it the whole time. 3. Lentil Soup On a list of implantation friendly foods that I found, lentils are number 1. I’m also pretty sure that lentils are good luck in some cultures. We also know that a warm uterus is a much more inviting place for embryos and blasts to set up shop, so soups and stews should always be on the 2WW menu! Sooo, the night before transfer, I made this big pot of homemade lentil soup out of all organic ingredients. And it actually tastes amazing! It will be my lunch until I run out. Added bonus: contains spinach, another ingredient on the list! 4. Fertility Affirmations I really believe in a mind / body connection. So as silly as I felt at first listening to an Australian woman say things like, “My IVF treatments are easy and successful. I am pregnant. My hormones are in perfect balance. My womb is ready to accept a strong healthy baby,” etc., I really do put a lot of stake in it. I have had a lot of self defeating talk in my life (“I know it’s going to be hard to get pregnant,” “I hate my reproductive system; it’s defective,” etc.) and I really think I did a lot of damage when I talked like that. Of course I did it as a defense mechanism, but lo and behold! — it did not defend me from $h!t. So… fertility affirmations all the way, baby! No use being negative now! Tomorrow is my Day 3 transfer of two embryos! (WHAT?!? WOOHOO! COME ON, LITTLE EMBIES! STAY STRONG & HEALTHY!) <– (because clearly they are reading my blog, and or have some superhuman way of already knowing what I am thinking and feeling). We are scheduled at 10 AM, and then R is dropping me off home for total rest and relaxation while he goes to work. I'm running out to the store tonight to prep for must haves. So what are the must haves? I’ve got my pineapple ripening on the counter (my mom thinks I’m nuts but is happy to cut it up for me anyway). 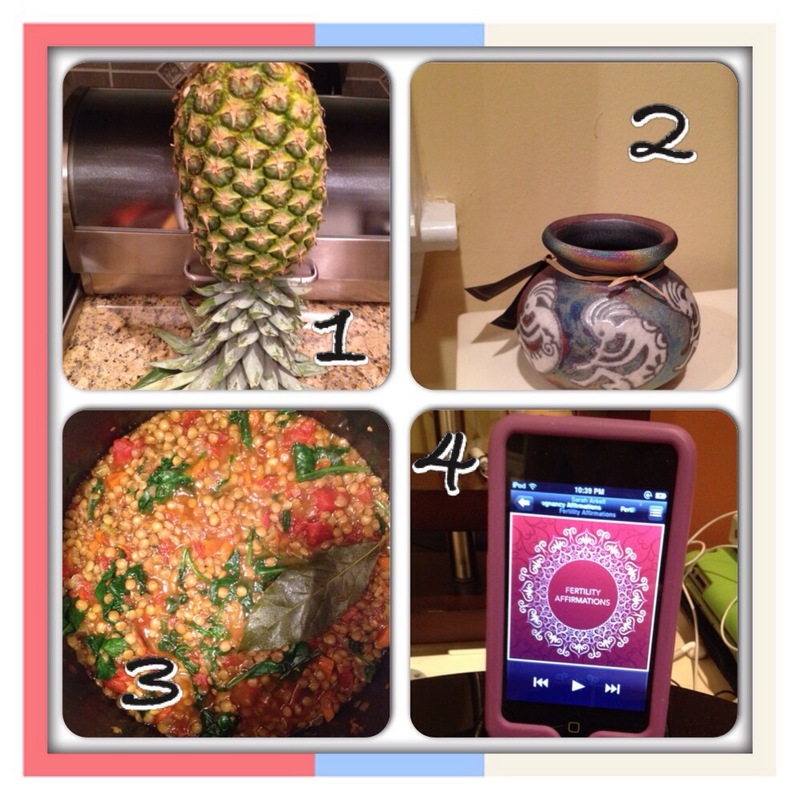 But other than the pineapple core, what else do I need to keep in mind tomorrow and during my special IVF two week wait? * What worked for you? * What do you swear by? * What do you avoid at all costs? 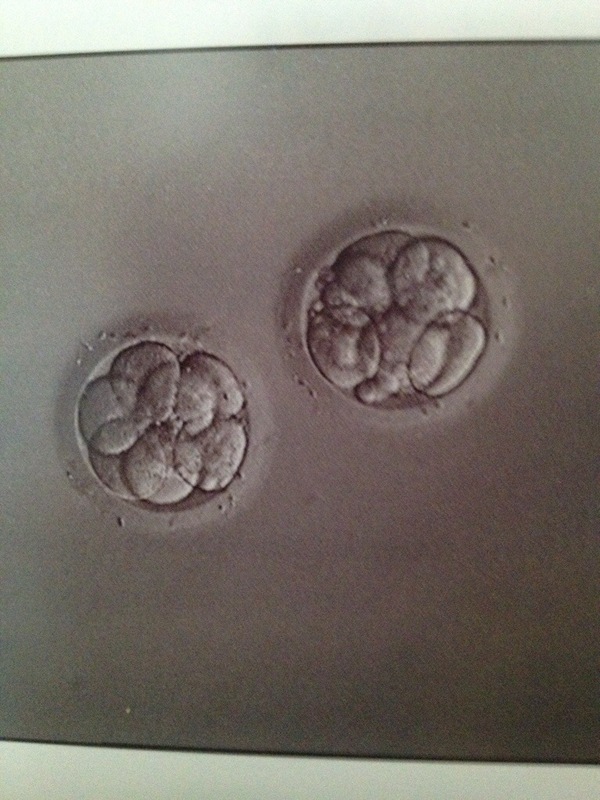 We will do a 3 day transfer on Saturday with two of the embryos. I am ridiculously nervous that we are doing a day 3 transfer. I am hoping it is only because of the low number of fertilized embryos (4) and not because of the quality of the embryos. I have read the 3 day success stories online but I still feel somewhat defeated at this point. Not even hoping for any frosties, just want two healthy implantable embryos for Saturday. Happy Anniversary, Happy Mother’s Day! Last month was a total bust in TTC land. I was upset at first, but the silver lining was not obsessing during my two week wait. I enjoyed the rest of the month, not worrying too much about caffeine and alcohol intake, and before I knew it, I was starting a new cycle. Right now, I estimate myself at around 2-3 dpo… but I don’t go crazy with charting or temping, so I don’t know for sure. I’m REALLY trying to be low key, but we all know how that goes. I find it really difficult to keep taking my prenatal vitamins, and to keep taking SUPER good care of my body during the times I know that I am not pregnant. I know that all of these things are healthy for me regardless, but it feels weird to me, almost like a jinx. If I stop anticipating a pregnancy with vitamins, then I am more likely to find myself pregnant. If I keep taking the vitamins, the fates look down on me laughing, “Boy, she is really jumping the gun, isn’t she!” I know this makes NO logical sense, but not many things in my life do. So I take the vitamins. I don’t freak out if I miss a day here and there. My morning coffee is usually decaf, unless I’m desperate. I abstained from alcoholic beverages on both Friday and Saturday this weekend. Tonight, I WILL toast my one year anniversary with a glass of champagne. But that’s all. Not-so-patiently waiting for May 24.